It doesn’t matter if you are just starting out learning to garden, or if you’ve been gardening for twenty years, some plants can be tricky to learn how to grow. In our Miniature Garden Center, we normally test each plant for resilience, which is why you won’t see much changes in our core inventory of true miniature trees, shrubs and bedding plants. All you are looking for is: some containers (see below), the right growing medium, the right choice of plants (seeds, seedlings or young plants) and a window, a balcony, a porch or an open area, preferably with a sunny and a shady part. In these mini-gardens one can easily control the type and condition of the soil and pest control is easier since one can isolate the infected plants. 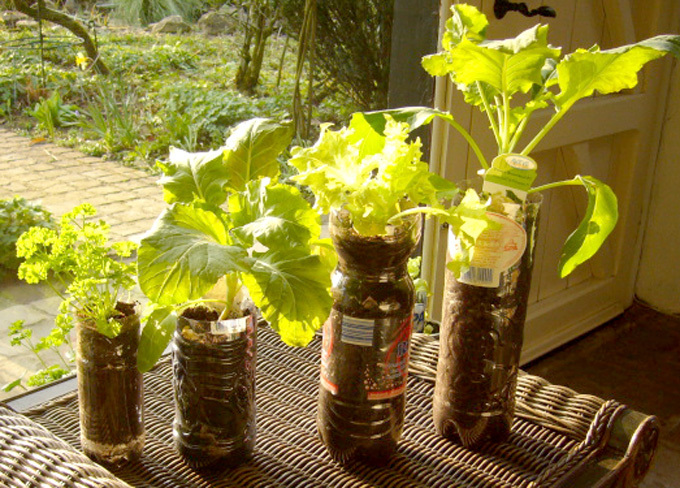 Container gardening in plastic bottles : (1) Top of bottle sits over hole in bottom of bottle, (2) Bottle filled with growing medium and parsley seedling planted, (3) Lettuce and cauliflower growing on a bottle, (4) Vegetables growing on bottles of different sizes. Containers will offer the joy of growing plants in an area where traditional gardening is impossible, e.g. in desert-like areas. Even when space is limited, like in urban areas, one can grow plants anywhere: on a windowsill, a doorstep, a balcony, a stair or a patio, even a rooftop, in hanging baskets or in old buckets. They all can provide enough space for an attractive and even productive (e.g. for vegetables) display. 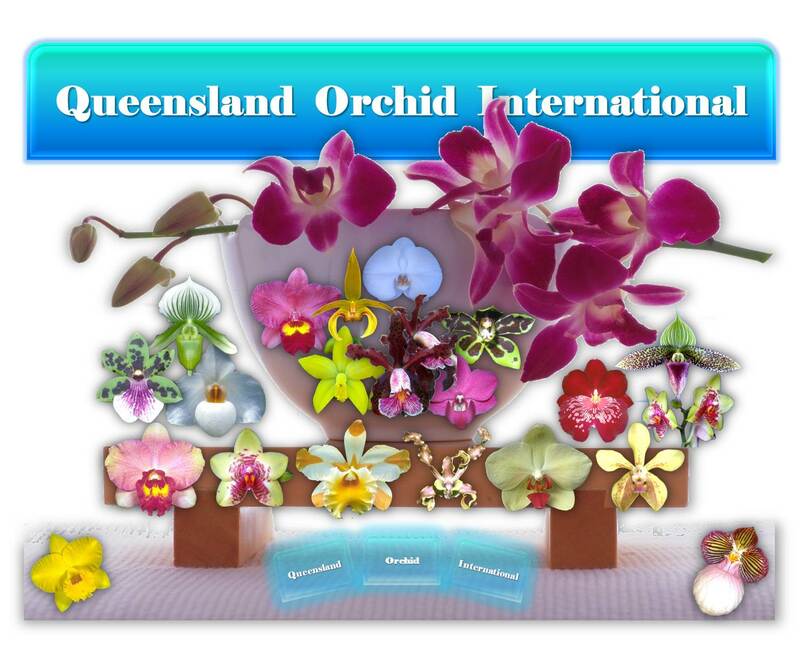 One can also grow different plant species in one single container in ecological relationships. Container gardening makes observation easy and, whenever necessary, containers can easily be moved around. They can be positioned as screens, serve as windbreaks, brighten a room or create shade. 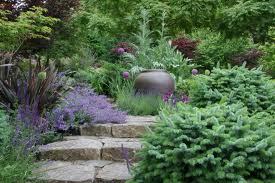 A well-planned container garden can be attractive (ornamentals) as well as useful (vegetables, fruits, herbs), e.g. to produce fresh food in the drylands or to combat desertification. Taking good care of it will result in a beautiful and functional display, but whenever deciding to give it a try: start small. Smaller gardens result in lower costs. Initial costs for container gardening may be a bit higher, but once all the necessary materials are purchased, costs are extremely limited: less growing medium, less fertilizer, fewer plants. Container gardening is only limited by lack of imagination. Who is who in container gardening? People in desert-like areas or in the drylands. People without garden space or with bad soil in their garden. 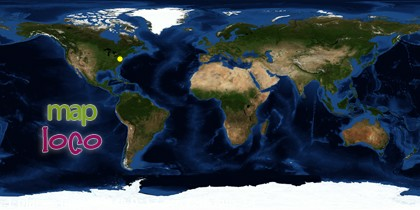 Urban people living in apartments or studios. People with limited time for gardening. Almost any type of container can be used for growing plants: flower pots, planter boxes, pails, buckets, bushel baskets, wire baskets, bushel baskets, wooden boxes, drums, nursery flats, gallon cans, window planters, washtubs, strawberry pots, tubs, plastic bottles and bags, large food cans, an old discarded wheelbarrow with soil and drain holes in the bottom or any number of other things. Containers can be purchased, built or recycled from all kinds of materials, even plastic bottles or plastic bags. It is always important to choose containers that best accommodate the chosen plant species. They come in a variety of sizes, shapes and materials. The choice will depend upon the type of plant and the location. The size of the container will vary according to the crop selection and space available. 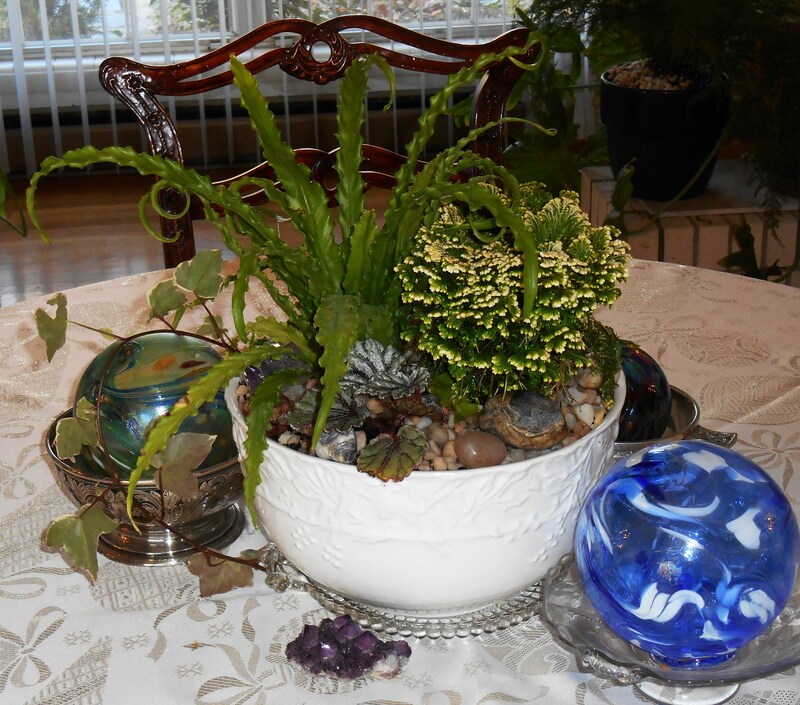 Keep in mind that the size, material and shape of the container should be conducive to your plant’s health. Generally, avoid containers with narrow openings. Plastic containers are lighter weight, but can become brittle in lower temperatures or they may deteriorate in UV of the sunlight. They are not porous and keep water over a longer period, but this may be an advantage in dry areas (see vegetable production in desert-like regions or in the drylands). Terracotta containers are porous, but heavy; they break easily and tend to dry out more rapidly. Glazed ceramic pots require several drainage holes. Wooden containers can be built to sizes and shapes suiting the location. However, many are susceptible to rot. Redwood and cedar are relatively rot resistant. Hanging baskets, often made of wood or wire, can drizzle onto furniture or the floor. Metal containers heat up rapidly which can cause root damage. Using a clay or plastic pot as a liner can help. Wrought-iron stands can minimize wood rot. 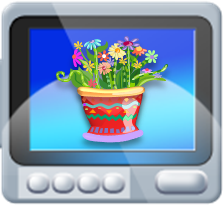 Window boxes are usually made of wood or plastic. Stone containers create a natural effect, are often difficult to move and break easily. Sunken containers work well for plants that spread easily. One can either bury the whole container or embed the rim to restrain the plant. Use containers with sufficient capacity, according to the size and number of plants to be grown in them. Small pots restrict the root area and dry out very quickly. Deep-rooted vegetables require deeper containers. For larger vegetables like tomatoes and eggplants, use a five-gallon container for each plant. Generally, most plant species can be grown in containers, as long as enough space to develop roots is provided. Shallow-rooted crops need a container at least 15 cm (6 inches) in diameter with a 20 cm (8-inch) soil depth. Match the dimensions of the plant to the pot. Consider how large the plant is likely to get at maturity, and pick a pot that gives it plenty of room to grow. Drainage is very important. Every container should have holes at the base or in the bottom to permit drainage of excess water, to prevent waterlogged soil and rotting roots. Waterlogged containers always end up with root rot. Line their base with a layer of coarse gravel, a piece of newspaper, a sheet of plastic etc. to prevent soil loss through the drainage hole. Any kind of feet under the container allows water to drain out. Place it on brick feet or blocks to allow free drainage or place a saucer under them to catch excess drainage and empty the saucer regularly. Dark colored containers absorb more heat, which can damage the plant roots and make it difficult for them to thrive. Paint them a lighter color or shade the container. In hot climates, use light-colored containers to lessen heat absorption and discourage uneven root growth. Line hanging baskets with sphagnum moss for water retention. Keep baskets away from heavy sun. When filled with moist soil, weight of the container can be a negative factor. When installing a large container, mount it on castors so that it can be moved easily. Except in cases where the containers are standing on normal soil, all types of containers need a saucer to collect the loose potting soil and dripping water that escapes from the bottom. Pour the collected water into a reservoir for future waterings, because it contains nutrients. Most plants prefer to be watered from the top down rather than wick the water up from below through the drainage hole(s). When excess water drains out of the container, spaces open up in the potting soil and air fills those spaces. It activates the microbiological activities in the soil, which helps to make nutrients available to plant roots. When the top of the container dries, the surface of the potting soil tries to pull moisture up from the bottom of the pot, but rarely does it all the way up to the top. So if only watering from the bottom, using a saucer full of water, it will never flush the soil. This can lead to accumulation of salt deposits on the container wall. A lightweight, well-draining, porous growing medium is needed, but it should also retain sufficient moisture because roots require both air and water. One can use successfully a soil conditioning compound like TerraCottem (see http://www.terracottem.com). The growing medium should contain sufficient organic matter (for microbiological activities). Outside garden soil should preferably not be used, because it is mostly too heavy, compacting when drying and then pulling away from the container wall. Heavy soils normally have high clay content and a low permeability, which makes them slow to absorb water. Once wet, they drain poorly. They are slow to dry out, insufficiently aerated and plants may not thrive in them (lack of oxygen for root respiration). Peat-based mixes, containing peat and vermiculite, are excellent. They are relatively sterile and pH adjusted. They also allow the plants to get enough air and water. Some gardeners do not recommend peat, because it is getting overexploited. Commercial potting mixes are relatively lightweight, but often slightly acidic; adding some lime may help to grow certain plant species (soil test: pH around 6.5-7.0). You can also mix your own: one part loamy garden soil, one part peat moss, one part coarse (sharp) sand, and a slow-release fertilizer (14-14-14) in the right dosage per volume. Some gardeners do not recommend peat moss (environmental concern), but compost. I would certainly recommend to use a small dosage of the TerraCottem soil conditioner to enhance the water retaining capacity an the nutrient content of the growing medium. TerraCottem also contains root stimulating agents, which make the plants growing better, even in very dry conditions. According to many gardeners a “soilless” potting mix (from a garden center) works best for container gardening. It drains quickly, is lightweight, designed specifically to deter insects and soil-borne diseases and is free from weed seeds. When filling a container, leave at least a 5 cm (2 inch) space between the top of the soil and the top of the container for adding some mulch (container should be about four-fifths full). Make it 10 cm (4 inches) for plants that need a lot of watering. When watering the container, the growing medium (substrate) will settle. Seeds are fragile and their viability is sharply declining if not treated properly. Some seeds survive many years under proper conditions; others lose their viability rather quickly. Keeping seeds in a cool, dark location with low humidity, will maintain their dormancy. They should be labeled (name, source, year) and stored in a small re-closable container, e.g. a film canister. When first sowing, test the viability of many, but not all, seeds by soaking them in water for a few hours. Generally, living ones sink to the bottom, the dead ones float. It is very rewarding to grow plants from seed, but it is not always an easy task. An overlooked aspect of plant propagation is record keeping: where the seeds are purchased, their quality and reliability, when they are sown, the germination date and success rate, and when seedlings are ready for transplanting. Such observations help to make adjustments for the following years. Seeds can be germinated in any container filled with a good substrate. As they retain moisture more consistently, plastic containers are preferable to clay ones. All containers should be clean (free of pathogens, by soaking them in a 10 percent bleach solution for 15 minutes and letting them air dry). Wide, shallow containers prevent both overcrowding of seedlings and too much moisture around the young roots. Sow in small, individual containers when seedlings are resenting root disturbance when transplanted. Commercial trays, but also recycled plastic containers, e.g. yoghurt or butter tubs, will do the job, after poking holes in the bottom for drainage. Once sown, the seeds should be evenly covered with a fine planting medium to the depth of two times the seed diameter, e.g. 0.5–1.5 cm (1/4 inch to 1/2 inch) for good germination. Very small seeds and light requiring ones (like grass seeds) should lie on the surface. Each seed must be in firm contact with the moist substrate to enable germination. Use any flat object or your fingers to gently tamp down the surface of the substrate. A plastic wrap over the container keeps its moisture level stable. Seeds are sensitive to over-watering or under-watering and heavy watering can disturb newly germinated seedlings. Should additional watering of a container be necessary, place it in a basin with 5-8 cm (2 to 3 inches) of warm water and allow the substrate to pick up moisture from the bottom. As soon as the seeds germinate, the plastic wrap should be removed. Seedling production should always be started in a warm room with sufficient sunlight. Most seeds will germinate best with 12 to 16 hours of light each day. Place seed containers in a south facing place and give the container a quarter turn each day to prevent seedlings from overreaching toward the light. Many seed species need rather high temperatures to germinate. If needed, install the seed container(s) close to a heater or on a windowsill under which a radiator of central heating sits to raise the ambient temperature. An embryo inside a seed relies on food stored in the endosperm. After germination, the shoot and cotyledons (if a dicotyledon species) emerge. Later on, the true leaves develop and photosynthesis starts. Mineral nutrients are absorbed from the substrate. 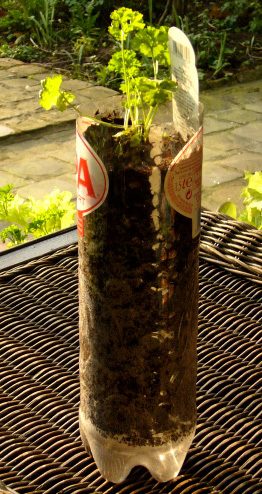 Proper fertilizing of the growing medium may be needed to keep seedlings growing strongly. Fungal infection is usually caused by excessive moisture and poor air circulation around the container or tray. Therefore, keep the surface of the soil around the young shoots dry and thereby create a hostile environment for pathogens. You can place a small fan close to the seedlings and let it blow at the soil level. Seedlings may need to be hardened off or acclimated to direct sunlight and changing temperatures by placing them in direct sunlight during the morning only of the first day, then increasing gradually their time outside. It may take 4 to 8 weeks before transplantation date into the final container. Easily transplantable vegetables are very suitable for container gardening. Seedlings are available in local garden centers or nurseries, or they can be grown at home. Most vegetable seedlings should be transplanted after developing their first two to three leaves. Transplanting must be carried out carefully to avoid injuring the young roots. Plant at the same time as in a regular garden. After planting, water the soil gently. Should stakes or other supports be needed, provide them when the plants are very small to avoid later root damage. Where to put a container, is governed by the growing requirements of the plants it contains. Most vegetables grow better in full sunlight than in shade. Plants that normally grow in full sun may well benefit from a bit of afternoon shade, especially in places where they can heat up very quickly. However, it is possible to position each of the containers in places where they have the best possible growing conditions. It is also better to foresee a source of water close to the containers for easy watering. The amount of light the container plants will need varies with the plant species. It will determine which crops can be grown. Leafy vegetables (lettuce, parsley, spinach, cabbage,) tolerate shady places, while root crops (radish, turnip, beetroot,) and fruiting vegetables (tomato, peppers, cucumber, eggplant,) need more sun. Most plants require a minimum of 5-6 hours of direct sunlight per day. Some gardeners use reflective materials, like aluminum foil or white-painted surfaces (even glass or marble chips) around containers to increase somewhat the available light. Since potting mix drains water rapidly, nutrients will be washed out of the container (leaching) with frequent watering. Therefore, it is necessary to supplement growth of container plants with fertilizer. Using a slow release or complete organic fertilizer at planting will keep your vegetables fed for the whole growing season. This can also be done with a soil conditioner like TerraCottem. After the first month of growth, add a diluted organic fertilizer (manure tea or compost tea, seaweed extract) when watering. One can apply such a diluted fertilizer every two weeks and adjust fertilizer levels as necessary, but remember to provide the plants with a variety of nutrients (mineral and organic, also trace elements). Follow the recommended rate of any fertilizer to avoid fertilizer burn by lack of soil volume. It is advisable to leach all the unused fertilizer out of the soil mix by thoroughly watering all containers with tap water to prevent buildup of injurious materials in the soil mix. This is already avoided with TerraCottem in the growing medium, because TerraCottem absorbs the excess of nutrients and keeps them available for plant roots. Container gardening is an excellent way of gardening to control and maximize water usage, but pots and containers always require more frequent watering than plants in the ground. 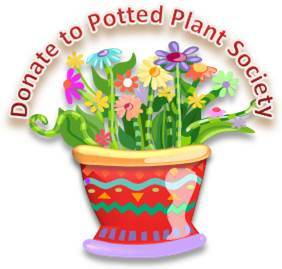 Small pots and porous containers, such as those made of clay, terracotta or wood, dry out very quickly; they have to be watered more frequently or one has to create shade for them. Because the volume of soil is relatively small, proper watering (generally once a day) is essential for successful container gardening. 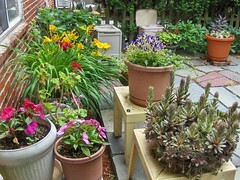 In an exposed location, container plants loose moisture very quickly by heating or wind. So do larger plants. Not all plants need to be watered at the same frequency. Some prefer even drier conditions, like succulents and cacti, which may go several days or even weeks without watering. Water should reach air temperature before applying it to temperature sensitive plants. Plastic containers (bottles and bags) retain the water longer. If the potting mix is getting dry every day (check the soil mix daily in warm temperatures; it should be moist 2-3 cm or 1 inch deep), group the containers together so that all leaves create a sort of canopy shading the soil and keeping it cooler. Mulching the containers with grass or gravel pebbles and installing windbreaks helps to reduce moisture loss by evaporation. If possible, water late in the day to reduce the hydric stress on the plants. Soak the potting soil very well and water again a bit later. The first watering usually leaves dry cavities within the potting mix, while the second watering fills them. Wetting the leaves should be avoided since that can cause leaf diseases. Varieties of different species have been developed specifically for container use (growing fresh, nutritious vegetables is possible on a window sill, a doorstep or a balcony). Many container plants are chosen because they are esthetically nice, but not necessarily edible. This is not the case in the drylands or desert-like areas, where people can grow food crops in containers. 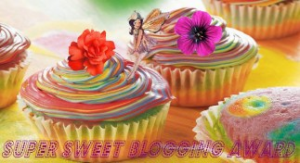 Some fruits, vegetables and herbs provide a remarkable aroma and taste. Consider planting parsley and carrots together, since parsley repels carrot flies. Those who can grow rather well in containers are unlimited and they can grow well together. However, it is better to start with only a few favorite things. Generally, small crops, which have a quick maturing period, are ideal, and compact varieties of normally large plants perform better, but vertical “climbers” also adapt quite well to container conditions, but they require more space because of their vining growth. Quick-growing small herbs and leaf lettuces can be planted around larger fruiting vegetables. Many herbs can be grown easily from seed. Since their seedlings need dark, warm and moist conditions, they thrive well in small container. They can later be transplanted or moved to the outdoor garden. When needed, container plants can be sheltered during periods of high temperatures. Remarkable displays, like those shown in gardening magazines, are the result of planting closer together than in a normal garden. This can be recommended for drought tolerant kitchen herbs. Consider growing mint, since it grows quite easily in larger containers (30 cm or 1 foot). Unlike parsley, mint cannot be propagated from seed, but from cuttings. Once mint grows, it can be harvested at any time, and cuttings can be taken for multiplication. Many successful container flowers (annuals and perennials) are grown in containers. Annuals are very easy. Perennials can grow larger over time and a combination with the right annuals might look overwhelming. Bulbs behave like annuals. It is easy to save them year after year and to collect bulbils for propagation. One can also grow shrubs and trees in containers. Some will flower, others not. Fruit plants need more attention. They need to be pruned and fertilized regularly. Permanent spots for larger plants may be necessary. However, some fruiting plants like figs can be kept in container with constant pruning. There will always be a need to build up the soil every year. Plants grown in containers can be attacked by various types of insects and infected with diseases that are common to any other type of garden. Plants should be periodically inspected for the presence of foliage and fruit-feeding insects, as well as for the occurrence of diseases. Containers can be arranged so that plants can attract and repel insects or flies. Some plants emit special chemicals (allelochemicals) from their roots or leaves, which repel pests. See books or Internet information for specific examples. It helps saving irrigation water (water conservation). It avoids a lot of hosing and weeding (time and labour saving). 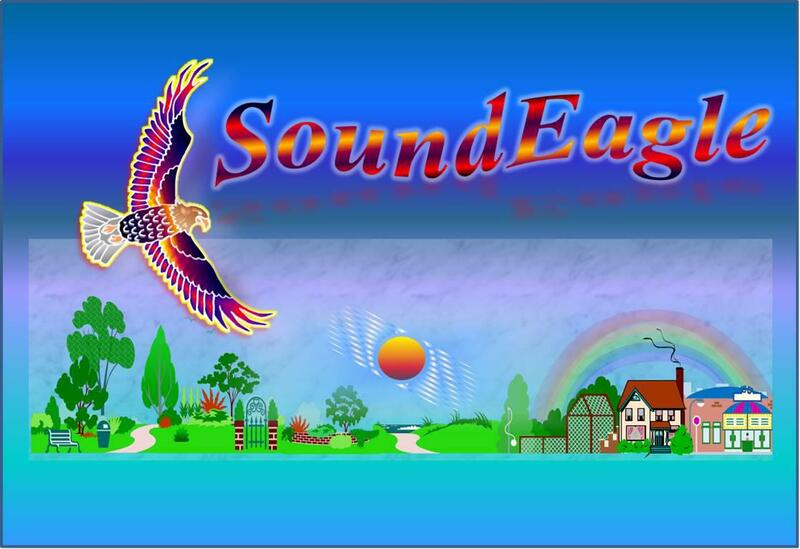 It enables gardening on all floors of apartment blocks and high buildings. It avoids competition with wildlife. Container gardens are close to the kitchen (fresh homegrown herbs). Possibility to intersperse containers with food crops and flowering plants (repelling insects). Easy to create good looking spaces (esthetics). I have the pleasure of announcing that we are starting up container gardening in plastic bottles and plastic bags in the refugee camps of the Saharawi people in the Tindouf region (S.W. Algaria), in particular in schools, where children will produce different vegetables and young fruit trees during the school year. They will contribute to production of fresh food with vitamins and mineral elements for the school cantina (kitchen), thus alleviating hunger and vitamin deficiencies. Here are some general ideas on CONTAINER GARDENING, more and more successful for food production in the drylands, for combating desertification and for growing plants in urban areas. The text below was already published back in 2007. 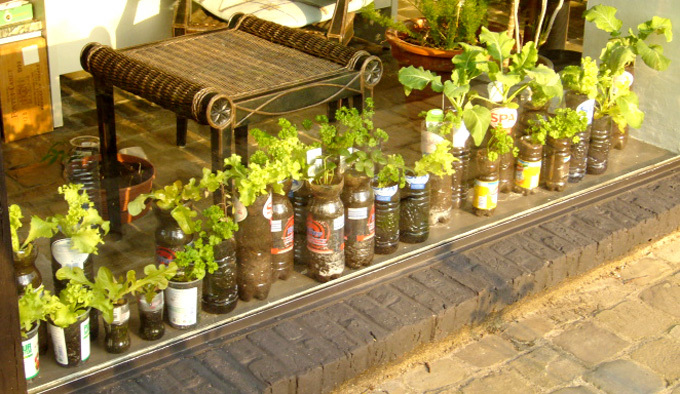 If you don’t have a good garden spot in your yard, why not grow some vegetables and herbs using container gardening? The most personal way to forge a connection with delicious food crops — from arugula to tomatoes — is to grow them up close in containers. Special methods are needed to produce high-quality food crops in containers, because most vegetables and herbs grow best when planted in the ground. Stable soil temperatures and constant access to water, nutrients and microscopic soil allies give in-ground crops a clear advantage. One only has to look at the old-age tradition of North American agriculture of planting corn, beans and squash together. Corn grows tall, trying to steal as much sun as possible and taking out a lot of nitrogen from the soil. Beans grow up the stalks of the corn looking for the sun too, but putting nitrogen back into the soil. Planting squash at the same time does well on the conditions and grows and spreads on the ground growing and harvested long after the harvest of the beans and the corn. Therefore, by inter-cropping, or companion planting, you have been able to grow 3 different vegetables in the same space as you would one.